A sure sign of a great book is when I have a hard time remembering that the characters are fictional, when I find myself thinking about them and wondering about their well-being, long after I’ve finished the final chapter. 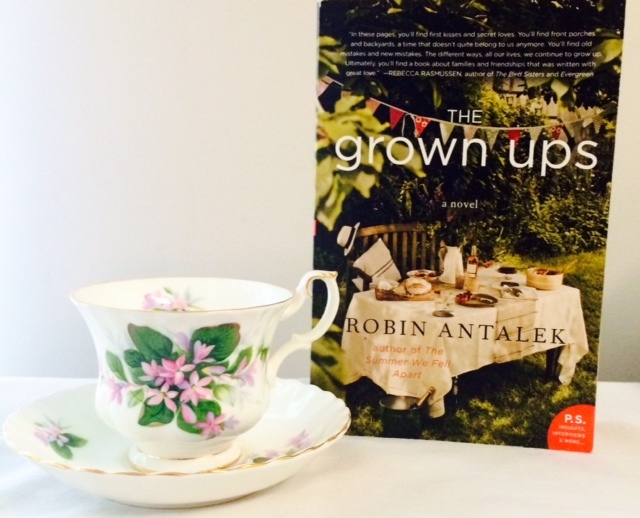 Robin Antalek’s The Grown Ups is just that kind of book. The Grown Ups spans more than a decade in the lives of a group of neighborhood families. Beginning with the summer when they are fifteen years old, the novel follows the stories of Sam, Bella and Suzie, three friends whose lives diverge and intersect over the years. Their loves, their losses, their family struggles and their dreams are chronicled in a beautifully woven narrative that takes unexpected yet completely natural turns at every corner. The book constantly carries the question of what it means to be a grown up, revealing times when children must be far too adult, and times when adults are in dire need of a guidebook. This honest novel tackles everything from sibling squabbles and ailing parents to broken hearts and broken homes, and I could not put it down. The characters are what truly make The Grown Ups shine. I came to know not only the three main protagonists, but everyone in the novel so intimately that I felt like I was living their lives right along with them. I haven’t stayed in touch with the people I went to kindergarten with and I didn’t grow up on a street filled with kids my own age, but in reading this book, I felt like I did. I cried with them, hoped with them, and got angry with them and for them. Watching them grow from who they were to who they would become was a beautiful journey. Did I get stressed out every time they would make the wrong decisions or when things started going badly for them? Absolutely, but that’s life—and as in life, I had to trust that everything would work out in the end. Thanks to Robin Antalek’s gifted hands and the care with which she created each and every character, I found it so hard to say goodbye after the last page. I would have followed this group through another decade (or two or seven), and I still find myself thinking about what they must be up to. If you’re looking for a great coming-of-age story, a family story or a story of friendship, please check out The Grown Ups. Just be prepared to forget the real world for a while, because you will absolutely get lost in the just-as-real world Robin Antalek has created. For more on Robin Antalek and her wonderful books, visit robinantalek.com and be sure to like her on Facebook. Special note: I discovered this book through Robin Kall’s fanTASTic Reading with Robin Book Club. I cannot say enough good things about this club! We meet online on Thursdays from 4-5 pm (ET) and have wonderful discussions with the authors of the selected books. (If you’re unable to participate live, you can post questions to the page for the author to answer during the chat.) There are so many great books lined up through the summer, so if you’re interested, you can request to join the group on Facebook and email Robin (robin@readingwithrobin) to be added to the list. It’s such a fun time! Looking for your next favorite book? Don’t forget to follow Book Perfume on Facebook and Twitter for more recommendations and all-around bookish fun. Sounds like a really fantastic read, I’ll definitely be adding it to my TBR! Thanks, Alysha! And congratulations on your debut!! this is fabulous!! thank you for sharing such a special novel and for all you do for our book club!! happy reading!!! Thank you, Robin!! Thanks for putting together such a wonderful book club! !